In Fearlessness in Everyday Life, meditation opens us to the groundlessness, uncertainty, and creativity of the world as it is. By increasing our capacity to be present with our anxiety, we are not blocked by fear. This course introduces the Buddhist teachings on emptiness and the nature of reality. Connecting with this unborn nature, we explore the clarity and precision of living in the moment. As warriors at this level, we dare to face life and death as they are. The meditator, open to uncertainty, goes beyond the emotions of hope and fear to experience equanimity. Themes covered in this course include groundlessness, impermanence and death, hope and fear, and the mahayana Buddhist teachings of emptiness and bodhicitta. Each class provides space for an open discussion. 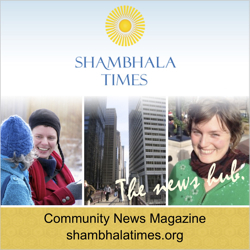 Fearlessness in Everyday Life is the fourth of the five weekly courses that accompany the Shambhala Training programs. It is recommended either before or after Shambhala Training IV.